I bought Thesis theme by DIYthemes in 2011 when I had first decided to switch from free to paid theme. The reviews of the theme were mostly positive. Tons of detailed tutorials were provided by bloggers, some who are making a lot of money from the affiliate sales alone. Since so many people were praising, I did not want to think much….just do it and move on. 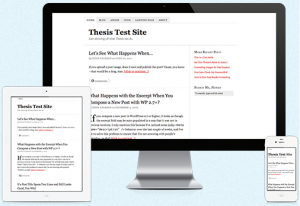 Thesis wordpress theme was then one of the most expensive theme in the market. Of course there are other paid themes but none had such extensive tutorials and sites dedicating articles and video tutorials. I bought the Thesis theme developer version- the most expensive one but allows me to update multiple sites and entitled me for lifetime upgrade (the price has gone up from the time I bought). Not long later, the workload in my full time job became more and more….I stopped having the energy to work on my sites and leave it at that. Of course, on and off I still fiddle around with my blogs and update a post. I also set up and maintains another person’s site under a different domain name. The earlier versions of Thesis requires you to know some sort of CSS or php, which was (and still is) alien language to me. A few times, I have tried to meddle with the CSS only to have the site go bonkers (CPR did not work on the wordpress admin site. I had to login to my admin panel at my hosting company to administer CPR). Now that I have more time to care for my sites again, I upgraded from Thesis 1.8 to 2.3 for all my sites and wow….am I amazed what Thesis could do. While fiddling with my blogs and trying to figure out stuff such as how to insert the Adsense ads, make certain things appear/ disappear, create Custom pages….I am not sure why I could not find any tutorials…..the kind that was available in abundance in the past. The only tutorials I could find were mostly created by Rick Anderson who not techie fellas may find too technical. I am not a coder and have no plans to be one. I just love to write and sometimes meddle with the site design/layout by just drag and drop stuff instead of writing CSS or some html. Thesis theme enables me to do the customisation that I want without needing to add any additional CSS (which may crash my site). If you have no knowledge and is not looking at something bombastic – just a functional and easy to manage site, then consider Thesis theme. Seriously. I would be writing more posts related to how I managed to use Thesis theme to customise my sites. I have no programming knowledge and cannot afford to employ any designer to maintain my sites (also I am a bit OCD and insist to do everything myself).